Mark Zuckerberg's team has a lot of following up to do. The Facebook CEO has endured two days of questions before Congress amid a data scandal involving Cambridge Analytica, a UK-based political data firm that worked for Donald Trump's presidential campaign. The firm improperly accessed data on 87 million Facebook users -- including Zuckerberg. He faced questions from 44 senators Tuesday, and is taking more from 55 members of Congress on Wednesday about everything from Facebook's data collection practices to how the site should be regulated in the US. Senator John Thune, a Republican from South Dakota, called attention to this diversion tactic on Tuesday afternoon. "Mr. Zuckerberg's answered a lot of questions today ... but there are also a lot of promises to follow up with some of our members and sometimes on questions about Facebook practices that seem fairly straightforward," Thune said. "I think it's going to be hard for us to fashion solutions to ... solve some of this stuff until we have some of those answers." Here are some of the questions that Zuckerberg skirted during the hearings. Senator Roger Wicker, a Republican from Mississippi, asked Zuckerberg about reports that Facebook tracks users' internet browsing activity even after they've logged out of the social network. "Senator, I want to make sure I get this accurate, so it would probably be better to have my team followup afterward," Zuckerberg responded. He said Facebook does this for a number of reasons, such as a security precaution and to ensure that ads are effective. He added his team would follow up with him with a full answer. But later, Zuckerberg admitted to Kathy Castor, a Democratic Congresswoman from Florida, that Facebook does track users even when they're not logged in. When asked by Senator Dean Heller, a Republican from Nevada, how long it takes to delete an individual's data, Zuckerberg said: "I don't know the answer to that off the top of my head. I know we try to delete it as quickly as is reasonable." He continued: "We have a lot of complex systems and it ... takes a while to work through all that. But I think we try to move as quickly as possible, and I can follow up or have my team follow up." But according to Facebook's guidelines, it may take up to 90 days to remove data once a Facebook account is permanently deleted. Zuckerberg also stressed that users have the ability to manage and delete their own data, but he failed to address how difficult it can be to purge data shared with third-party companies like apps through Facebook. (Users have to contact apps directly and ask them to delete their personal data). Senator Graham, a Republican from South Carolina, asked Zuckerberg to name Facebook's biggest competitor. "Senator, we have a lot of competitors," he said. "Can I give a bunch?" He added that Facebook overlaps with companies such as Apple, Microsoft, Google and Amazon. Zuckerberg responded: "It certainly doesn't feel like that to me." Facebook owns three of the top 10 free apps in the Apple App Store: Facebook, Instagram, and Messenger. It also owns Whatsapp. Senator Grassley, a Republican from Iowa, asked the CEO why Facebook doesn't explicitly state all the ways in which users' data might be used. "Long privacy policies are very confusing," said Zuckerberg, adding other tech companies have run into the same challenges. Congresswoman Anna Eshoo, a Democrat from California, said on Wednesday Facebook needs to make it "transparent, in pedestrian language." Zuckerberg didn't offer a solution for now. Is Facebook willing to change its business model? 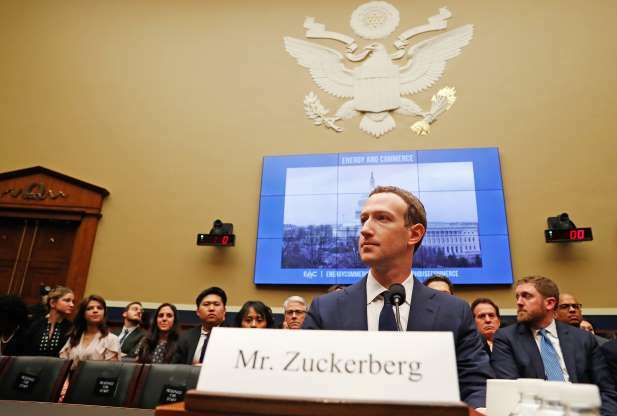 Congresswoman Eshoo also questioned Zuckerberg on whether the company would consider changing its business model to better protect user privacy. "I'm not sure what that means," Zuckerberg responded. Eshoo said she would follow up with him later. Earlier, Zuckerberg hinted at the possibility of a paid version of Facebook, saying there "will always be a version" of the social network that is free. Zuckerberg added that Facebook's mission is to "help connect everyone around the world and to bring the world closer together. In order to do that, we believe that we need to offer a service that everyone can afford, and we're committed to doing that." While Senator Thune acknowledged that "most of us understand" that if you're using a free service such as Facebook, you trade certain information about yourself in return. "But for this model to persist, both sides of the bargain need to know the stakes that are involved. Right now, I am not convinced that Facebook's users have the information that they need to make meaningful choices," Thune said.